Like many Charlie Parker compositions, "Scrapple From The Apple" is based on the changes to another well-known tune-- usually a popular song from that era. In this case, the composition was "Honeysuckle Rose". Basically, the idea was to pick a song with interesting soloing changes, and then write another melody over it. Often though, the new melody would call for alternate changes: a different chord here, an extra ii-V there... just to make things a little more interesting or more challenging for the improviser. This is just a simple ascending diatonic progression. The purpose would be to smoothly link the Gm7 to the C7. We could also play Bb6 in place of that BbMaj7, which becomes an inversion of our Gm7. If we start to think in terms of inversions, we will be able to smooth out the bass movement between chords, without a need to re-harmonize. Let's revisit the first 4 measures then. Gm7/Bb | C7 | Gm7/D | C7/E | FMaj7 | etc. | Gm7/D | C7(b9)/Db | Gm7/Bb | C7(b9)/Bb | FMaj7/A | etc. Click here for explanations on Reading The Chord Diagram Studies. Inversions can also allow us to squeeze in more chords into those same first 4 measures. | Gm7 Am7 | Gm7/Bb Am7/C | Gm7/D | C7/E | etc. | Gm7 Am7 | Gm7/Bb Am7/C | Gm7/D Am7/E | Gm7/F C7/G | FMaj7/A | etc. 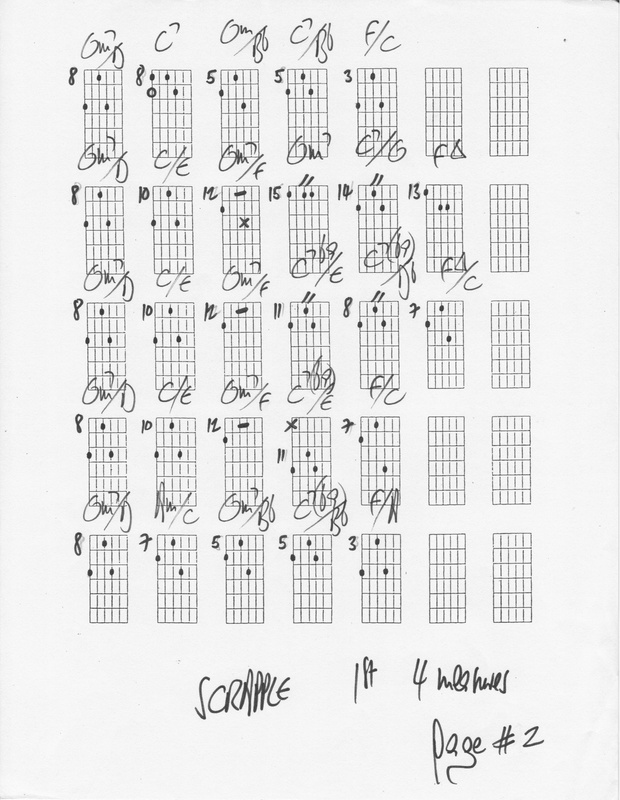 The chords for the Bridge are the same as for "Rhythm Changes" (in the key of F Major). All of the usual substitutions used for "Rhythm Changes" will apply here as well: companion ii7 preceding some of the Dominant chords, Tritone subs, etc. Interestingly, there is no actual melody for the bridge: players either improvise those 8 measures, or sometimes let the drummer solo. 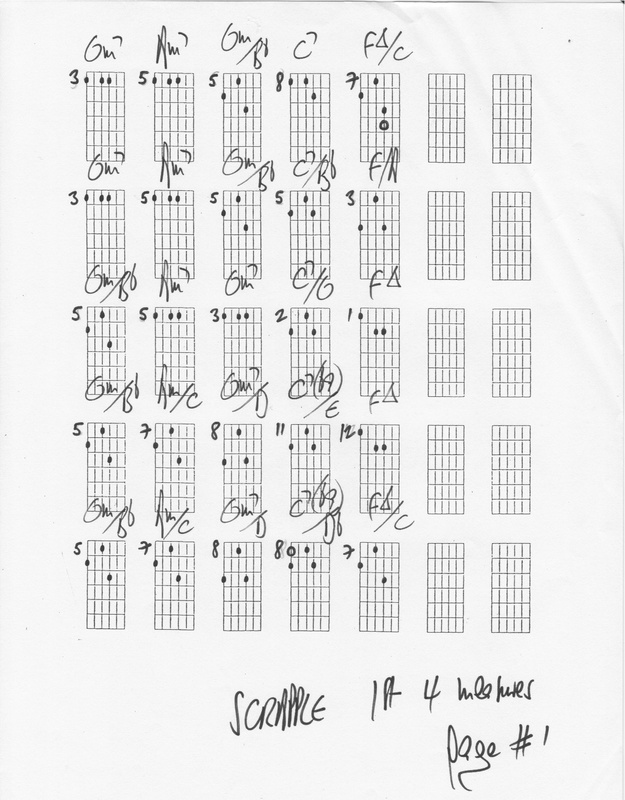 Order 2 chord studies for "Scrapple From The Apple" written in diagram form (similar to the one presented on this page). The studies come in pdf format and will be e-mailed directly to you within 24h. I am available for private lessons on SKYPE or FACETIME for more information on this topic, or on anything related to Jazz Guitar, Improvisation or Music Theory.